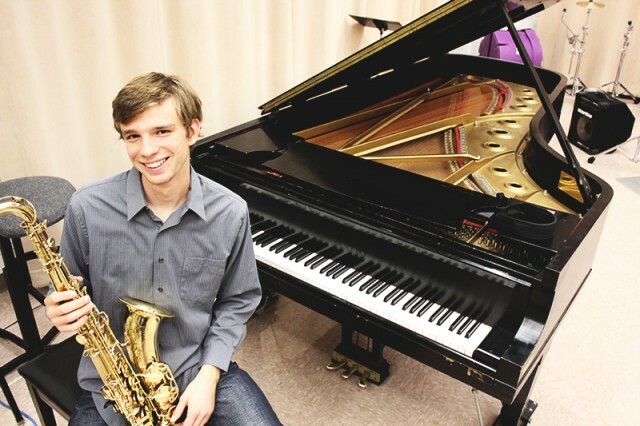 Jacob Penner reflects on the history of jazz as it connects to his experience with jazz on campus. Last week’s piece by Abbie Kaser on orchestral appreciation resonated strongly with me. Here at Goshen, choir is clearly king, and that’s not necessarily a bad thing. The Goshen choirs are incredibly talented and deserve all the attention they get, filling Sauder Concert Hall with a joyful noise on a weekly basis. But beyond choir and even beyond orchestra we have Lavender Jazz and the newly formed Lavender Jazz Small Combo. We perform music rich in soul and swing; music that is inseparable from some of the most influential movements in American history. Jazz is a mix of composition and improvisation that provides a unique experience on the band stage. When we listen to an improvised jazz piece, we are the first people ever to hear the tune: no one has ever played music like it before, and no one will ever hear anything like it again. At the same time, jazz builds upon the rich heritage of the past, with modern artists standing on the shoulders of giants like Louis Armstrong and Charlie Parker. Jazz was born in the impoverished neighborhoods of New Orleans in the early 1900s. The music soon spread from coast to coast, diversifying in each region: Dixieland in the south, swing and blues in the Midwest, “cool” jazz on the west coast, and bebop in the big cities of the northeast. Soon jazz was affected by global influences like the gypsy jazz of French guitarist Django Reinhardt and the Latin rhythms brought in by Cuban percussionist Chano Pozo. As jazz came of age, it became entwined with the Civil Rights movement. Many great jazz musicians were black, and used their music to address the injustices and discrimination they encountered every day. In 1939 singer Billie Holliday recorded “Strange Fruit,” a song describing the hypocrisy of a South that celebrates its natural beauty and polite culture while terrorizing and lynching black community members, a critique that remains painfully relevant today. In 1964, following the bombing of a church in Birmingham that killed four young girls, saxophonist John Coltrane recorded a song based on a speech by Martin Luther King at the ensuing funeral. Simply titled “Alabama,” it’s one of the most haunting pieces I have ever heard. Some historians like to say that jazz has grown up alongside our country, part of the good and bad, and I don’t think that’s too far from the truth. So jazz clearly isn’t just for dancing: it’s for listening. If done right, the role of an audience member at a jazz concert can be just as fun as that of the musicians themselves. Watch the interplay between the drummer, pianist, and bassist, listen as they play off the rhythms that the others come up with. Pay attention to how a good soloist responds to the urgency of a changing drum beat or the syncopation of the piano chords. Jazz is an emergent music, at its best when the creative potential of every band member is brought together at once. Soak up the emotion that we put into the music and interpret it in your own way, without the predetermined messages associated with words and lyrics. Tap your foot, nod your head with the groove: a good band should make this easy. You may think I’m writing this simply to promote our upcoming concerts (LJ plays Friday at 7:30 in Sauder with the all-campus band and the small combo plays Tuesday at 7:30 in Reith with a special guest), and you’re not wrong. But I also feel the need to communicate our collective passion for this music. It is music we work hard to prepare, and given how infrequently we perform, we would love to play for a full house. See you Friday.